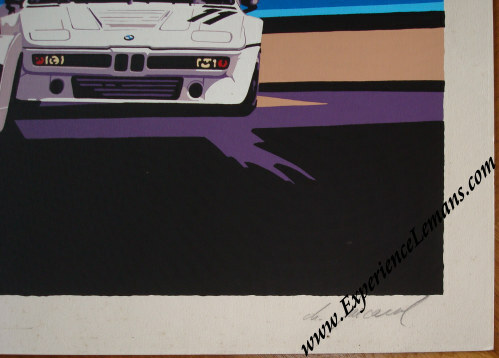 Artist Proof for the 1980 24 Hours of Le Mans Poster Artwork signed by Charles Pascarel. This is an original "Artist Proof" of the artwork for the 1980 Le Mans poster, signed by the artist, Charles Pascarel (1936). An Artist Proof is an impression of a print taken in the printmaking process to see the current printing state of a plate while the plate (or stone, or woodblock...) is being worked on by the artist. This particular Artist Proof comes extremely close to the final version. It is signed by the artist in the lower right corner while the lower left corner is marked "E.A" which stands for "Epreuve Artiste", French for Artist Proof. In total it measures some 85 x 65 cm which is considerably larger than the poster which measures 53 x 38 cm. The 1980 Le Mans poster is part of the "Early Sponsorship and Advertising" era in Le Mans posters and which lasted from 1975 to 1980. 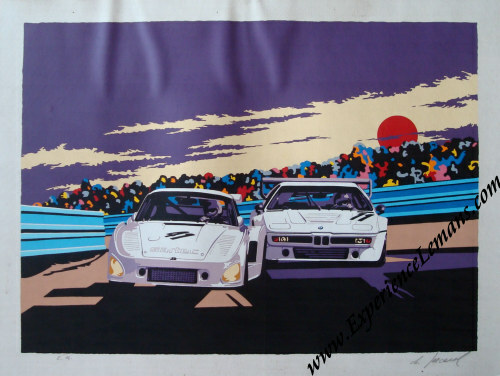 Charles Pascarel found inspiration in the world of the comic strip and shows a great atmospheric rendition of the 1979 winning Porsche 935 K3 of Klaus Ludwig and Bill & Don Whittington battling it out with a BMW M1. Production and lay-out of the poster itself were in the hands of the Publi-Inter agency. The race was won by Jean Rondeau and Jean-Pierre Jaussaud in their Nr 16 Rondeau M379B with a total of 338 laps to their name. For the full results of this race, please see 24 Heures du Mans results 1980. 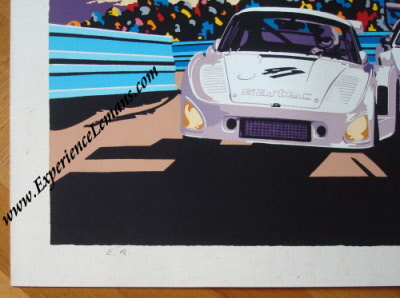 This very rare Artist Proof for this iconic Le Mans poster is in excellent condition but a bit wavy at the top as visible in the photograph.